There are certain plants in our garden which evoke memories of people of places and of points in life. 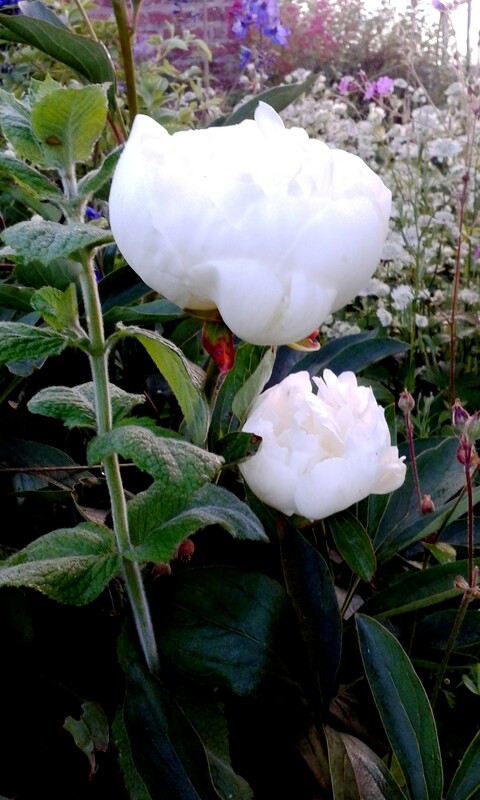 What prompted this thought was the sight of ‘Auntie Iris’ peony’ which is laden with highly scented white blossoms at the minute. I have never been able to accurately name the plant but I have childhood memories of the peony in the wonderful formal garden Auntie Iris had on the shores of Strangford Lough near Killyleagh. When she moved from the garden she lifted the peony and I think it is at that point that my Dad had a cutting and I took a cutting from his plant for our first little garden in Nottingham. Having come over to County Down for a holiday with my family it is good to know that the flowers that we picked from Mum and Dad’s garden and are scenting our holiday house in Strangford are only about 8 miles ‘as the crow flies’ from their original home in Auntie Iris’ garden. This entry was posted in gardening, gardens, plants and tagged flowers; Strangford, free ranging thoughts, growing, memories by Free Ranging. Bookmark the permalink.